The dot-plots tell us that the FOMC now thinks that it is headed for a 3% Treasury Bill rate–at the upper end of this range, but still very far from a 5% rate. And if we do live in a semi-permanent age of secular stagnation, this will not be a temporary inconvenience but, rather, a permanent structural fact. That means that if the FOMC keeps its current inflation target then it will have only 3% of sea-room when the next big recession comes, whether next year, next decade, or a quarter century from now. That means that if the FOMC keeps attempting to raise interest rates back to a 5% normal–or even, unless it is lucky, to a 3% normal–it will find itself continually undershooting its inflation target, and continually promising that rates will go up more real soon now as soon as the current idiosyncratic fit of sub-2% inflation passes. I do not know anybody seriously thinking about all this who thinks that 3% of sea-room is sufficient in a world in which shocks as big as 2007-2010 are a thing. And I do not know anybody seriously thinking about all this who thinks that pressing for a premature “normalization” of interest rates is a good idea. Because, “a world in which shocks as big as 2007-2010 are a thing” is only true if the Fed so wishes. What does and does not make sense? The Great Recession was larger than any previous post WWII recession. But that is not what it will be mainly remembered for. 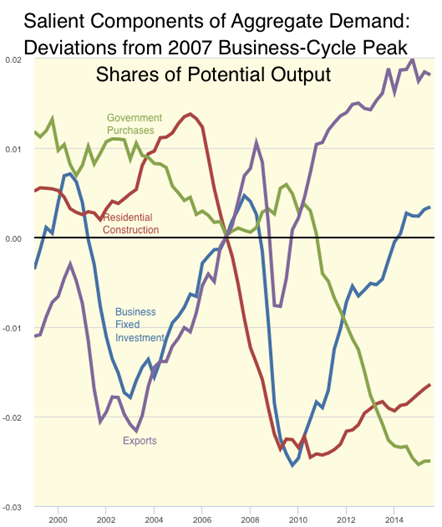 Unlike previous recessions, it appears to have led to, or coincided with, a permanent reduction in the productive potential of the economy relative to previous trends. According to measures of potential output put out by the CBO, the coincidence is clear, with a marked kink in the level of potential output occurring concomitant with the “Great Recession”. If that´s true, as the chart shows the economy has essentially closed the “gap”. 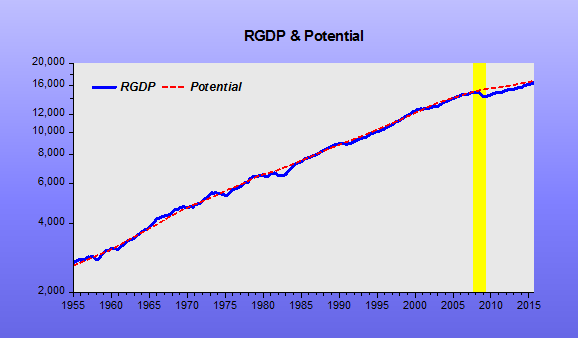 However, according to a deterministic trend, estimated from 1955 to 1997 and projected forward, the “gap” has been rising given that real output growth, after dropping hard during the “GR” has never “bothered” to grow sufficiently to close the “gap”. First it was the 2007 financial crisis. Then it became the 2008 financial crisis. Next it was the downturn of 2008-2009. Finally, in mid-2009, it was dubbed the “Great Recession.” And, with the business cycle’s shift onto an upward trajectory in late 2009, the world breathed a collective a sigh of relief. We would not, it was believed, have to move on to the next label, which would inevitably contain the dreaded D-word. But the sense of relief was premature. Contrary to the claims of politicians and their senior aides that the “summer of recovery” had arrived, the United States did not experience a V-shaped pattern of economic revival, as it did after the recessions of the late 1970s and early 1980s. 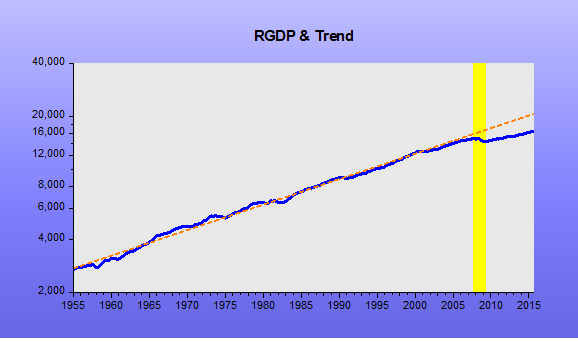 And the US economy remained far below its previous growth trend. A year and a half ago, those who expected a return by 2017 to the path of potential output – whatever that would be – estimated that the Great Recession would ultimately cost the North Atlantic economy about 80% of one year’s GDP, or $13 trillion, in lost production. If such a five-year recovery began now – a highly optimistic scenario – it would mean losses of about $20 trillion. If, as seems more likely, the economy performs over the next five years as it has for the last two, then takes another five years to recover, a massive $35 trillion worth of wealth would be lost. When do we admit that it is time to call what is happening by its true name? If we stick to the more plausible idea that this is all somehow the result of the financial crisis and recession, we can again split explanations into two types: those that focus on the financial crisis and argue that crises of this type (rather than other types of recession) impact on potential output, and those that look at the impact of the recession itself. The distinction is important in understanding the impact of austerity. If the length and depth of the recession has permanently hit potential output, as Fatas and Summers suggest, then the cost of austerity is much greater than we could have imagined. But I believe that´s the wrong focus. 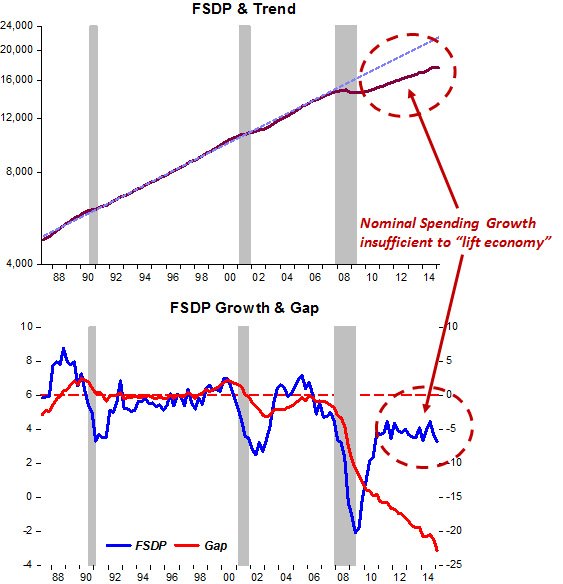 The charts show that the economy was “suffocated” not by austerity, but from a highly inadequate monetary policy, as indicated by the behavior of aggregate spending or NGDP. And that wrong-headed monetary policy remains in place today! Talk to people at the Federal Reserve these days about how they feel about the institution’s performance during the seven very lean years from late 2008 to late 2015, and they tend to be relatively proud of how the institution performed. Almost smug. And repeats the chart 5 times, each time emphasizing a different demand component. He could have saved time and space and put up the only chart that matters, which also indicates that the Fed cannot be proud or smug about its performance. 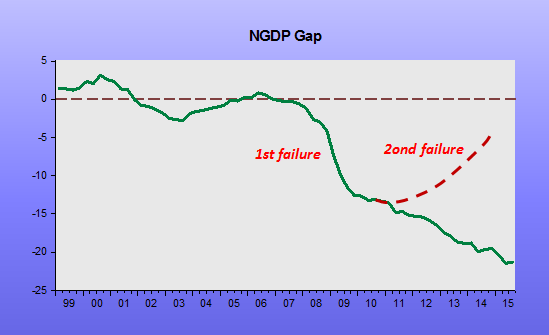 That´s the NGDP Gap chart, which shows that the Fed began the road to perdition in early 2008 and later failed to “turn the boat around”! As bubbles go, it was not a very big one. 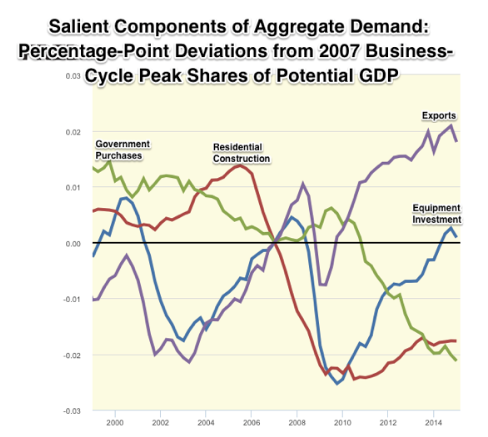 From 2002 to 2006, the share of the American economy devoted to residential construction rose by 1.2 percentage points of GDP above its previous trend value, before plunging as the United States entered the greatest economic crisis in nearly a century. According to my rough calculations, the excess investment in the housing sector during this period totaled some $500 billion – by any measure a tiny fraction of the world economy at the time of the crash. The resulting damage, however, has been enormous. The economies of Europe and North America are roughly 6% smaller than we would have expected them to be had there been no crisis. In other words, a relatively small amount of overinvestment is responsible for some $1.8 trillion in lost production every year. Given that the gap shows no signs of closing, and accounting for expected growth rates and equity returns, I estimate that the total loss to production will eventually reach nearly $3 quadrillion. For each dollar of overinvestment in the housing market, the world economy will have suffered $6,000 in losses. How can this be? Today, we recognize that clogged credit channels can cause an economic downturn. There are three commonly proposed responses. The first is expansionary fiscal policies, with governments taking up the slack in the face of weak private investment. The second is a higher inflation target, giving central banks more room to respond to financial shocks. And the third is tight restrictions on debt and leverage, especially in the housing market, in order to prevent a credit-fueled price bubble from forming. To these solutions, Keynes would have added a fourth, one known to us today as the “Greenspan put” – using monetary policy to validate the asset prices reached at the height of the bubble. Just rewrite the underlined sentence as “keeping nominal spending on a stable level path” (a.k.a. NGDP-LT)! So, it appears even Keynes knew that to be the best option! Even a Great Stagnation requires planning! Suppose you lived in a world where, whenever the price level fell/rose by 1%, the central bank responded by decreasing/increasing the base money stock by the same 1%. A world like that would not have a long-run Omega point, from which some present equilibrium can be pinned down by back propagation induction. That’s the sort of world we live in, under the inflation targeting regime. A drunk doing a random walk does not have a destination, from which we can infer his route by working backwards. His long run variance is infinite. Stop arguing about whether a market macroeconomy is or is not inherently ultimately self-equilibrating. It’s a stupid question. It depends. It depends on the monetary regime. Instead, let’s solve the stupid question by adopting a nominal level path target. It´s even worse. If you don´t plan, i.e. provide a “destination” for it, even a “Great Stagnation” becomes “random”! The first shows why the “Great Moderation” happened. 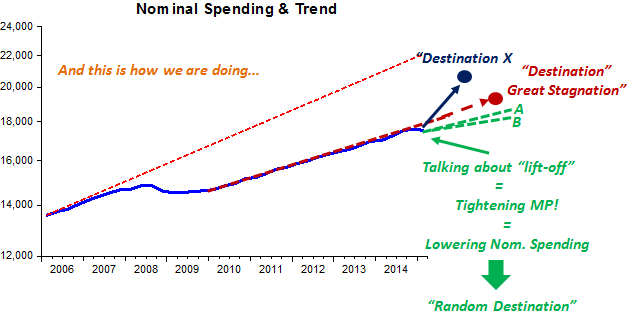 The “destination” was the trend level path, to which the economy returned after monetary policy mistakes dislodged it. Observe what many called a period of “too low for too long” rates doesn´t look like that at all! In the second chart, we note that after the Fed pulled the economy down, it has been satisfied in keeping it down, i.e. “depressed”. It could come out and say that that´s the path (“destination”) it wants it to follow. But no, by saying it´s about time to “tighten” policy, it is implying that the path might be even lower. Is it A? Is it B? The truth is no one knows! It certainly does not appear to be X! Will new tools help to “save” the economy? The Bureau of Economic Analysis plans to launch two new statistics that will serve as tools to help businesses, economists, policymakers and the American public better analyze the performance of the U.S. economy. These tools will be available on July 30 and emerge from an annual BEA process where improvements and revisions to GDP data are implemented. BEA created these two new tools in response to demand from our customers. Meanwhile the “more government crowd” is strident. When we have a recession caused by demand deficiency such that interest rates hit their Zero Lower Bound (ZLB), the obvious response from a macroeconomic point of view is fiscal stimulus. Instead governments have become obsessed by their debt and deficits, and so we have austerity instead. And governments are not responding to market signals: financial markets are telling them that they have a once-in-a-lifetime opportunity to advantageously pull spending forward from the future into the present and push taxes back from the present into the future. But, because of the ideology of austerity, they are not taking advantage of this opportunity. 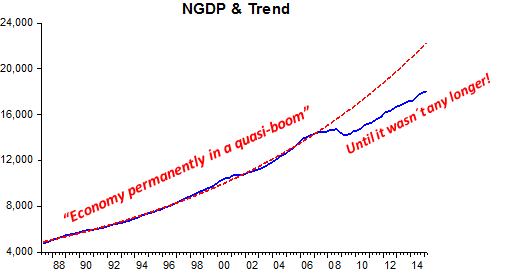 Brad calls a spade a spade: “Economy is depressed”, but it´s not because of his GDP components reasons. Take Final Sales of Domestic Product (FSDP), to remove some of the volatile components of NGDP. The charts below show how it has performed relative to the “Great Moderation” trend. 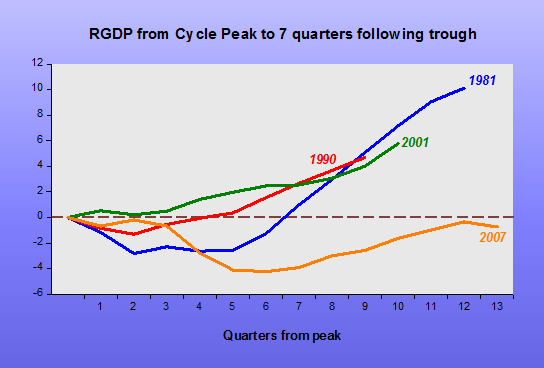 You also see that the 90/91 and 2001 recessions were “overcome” when FSDP growth managed to get FSDP back on trend. Not so following the “Great Recession”, with the result being a depressed economy. This predicament is not due to “residual seasonality”, “inappropriate tools for analyses” or “ideology of austerity”. 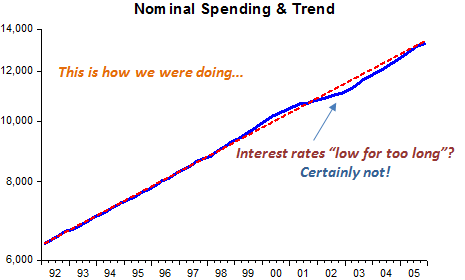 It´s wholly due to the Fed constraining the growth of nominal spending at an inadequate level, one that has persisted for 5 years! 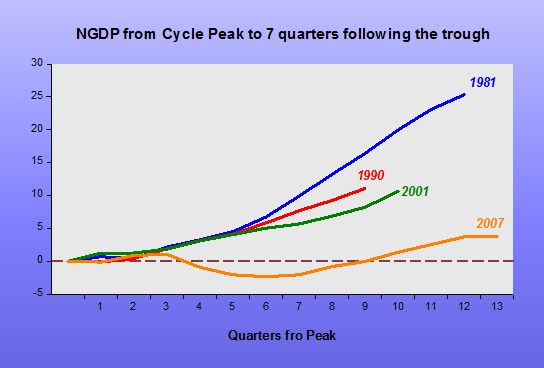 It´s beyond belief that “growth stability” for that length of time is just a coincidence! Earlier I spoke of ‘price stability’ as being one of the components of ‘internal balance’. Yet in the outline which I have just given of a possible distribution of responsibilities no one is directly responsible for price stability. To make price stability itself the objective of demand management would be very dangerous. If there were an upward pressure on prices because the prices of imports had risen or because indirect taxes had been raised, the maintenance of price stability would require an offsetting absolute reduction in domestic money wage costs; and who knows what levels of depression and unemployment it might be necessary consciously to engineer in order to achieve such a result? The “price stability” obsession is the reason the economy was “knocked down” in 2008! Unfortunately, the economy has remained depressed for too long. That has certainly “sapped its strength”. Nevertheless, a higher level of spending is certainly achievable. Maybe, for incomprehensible (to me) reasons, it´s not desired!